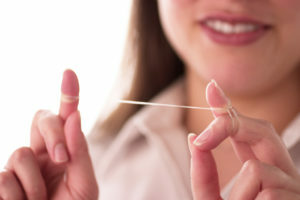 One habit that’s easy to overlook is flossing your teeth. This is actually a very easy habit that many people skip because they feel it’s time-consuming or they’re too tired. However, flossing removes the plaque and bacteria buildup in between your teeth, which is essential since you can actually get cavities in between your teeth. If flossing is not currently a part of your home care routine, start by committing to at least one day a week and then slowly add days as it becomes a habit. While it may be simple to remember to brush your teeth when you wake up in the morning, brushing before bed is easier to overlook, especially if you’re tired after a long day. However, brushing before you go to sleep is essential because it removes all the bacteria in your mouth left there from the food you’ve eaten throughout the day. If the debris is not removed during brushing, the bacteria will turn into plaque that sits on your teeth and breaks down your enamel. New years is an excellent time to make some healthy changes to your diet. If you find that you need an afternoon snack, consider choosing fruits and veggies over chips, crackers, or bagels. Fruits and vegetables wash away the excess debris in your mouth left over after meals by increasing saliva flow. They also neutralize the acids in your mouth that cause tooth decay and cavities. Studies have shown a direct correlation between your oral health and other concerns in the body such as heart disease, high blood pressure, and diabetes. Visiting your dentist in Midland, TX every six months for cleaning and checkup is vital not only for your oral health but also your overall health and well-being. During every routine examination, your dentist screens for issues such as gum disease, tooth decay, and cavities. Early detection of these concerns gives you the best chance of successfully treating them. Patients with dental insurance can enjoy the fact that routine cleaning and checkups are typically covered, which means that there is little to no out-of-pocket cost for your six-month appointments. If you don’t have dental insurance, ask your dentist’s treatment coordinator for some helpful tips on fitting dentistry into your budget. Contact your dentist today for more information or to schedule your next visit. At Boyles General Dentistry & Implant Center, patients enjoy the knowledge and expertise of three general dentists who can provide comprehensive dental care due to their combined total of nearly 80 years of experience. If you would like to contact our dentists, our office can be reached by calling 432-685-7011 or through our website.